alt-text-"I'M SORRY, FROM YOUR YEARS OF CONDESCENDING TOWARD THE 'SQUISHY SCIENCES', I ASSUMED YOU'D BE A LITTLE HARDER." I gotta say, I'm pretty enamored of the notion of slaying one of the horsemen of the apocalypse. Maybe I gotta change fields. I don't know that math has ever done that. I dunno; creating a horseman of the apocalypse is pretty badass. In principle, they also slew Famine (with some help from the chemists), except we're really bad at distributing food(and wealth in general, but the point here is food), dangerously overfeeding some, and starving others. As a biology student turned mathematician/computer scientist, I'm bookmarking this one, along with Purity. Now I can cherrypick to make any of my favourite fields sound superior to any other field, even each other. Of course, the real point is that all (natural) sciences (plus math and informatics, which are exact but not natural) hugely improved the human condition, each in their own way. Also, yeah, until some goofball biologist lets the lab strain of smallpox escape, biology does seem to have the best track record for not causing actual disasters. Some of the heroes of physics became the heroes of biology discovering the structure of DNA after being disillusioned from their experiences with the Manhattan Project. The structure of radiation-mutated DNA must've been particularly tricky to figure out. 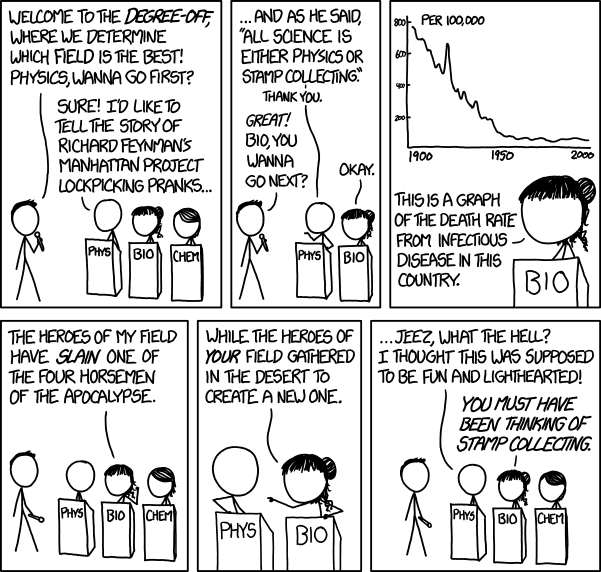 Also, wouldn't the physicist of all people be the most tired of the pop culture lionization of Feynman? Sure, he wrote an entertaining memoir, but even I, well outside the field, don't believe he was the ne plus ultra of physicists. Did the physics guy really not have a better defense of his degree than the alleged awesomeness of one self-consciously quirky dude and his wacky hijinks? Chem: well, we helped a lot! Both causes, actually, we're pretty lawful neutral over here. As an engineer I can state that my field is also Neutral. I'm doubting between True Neutral and Lawful Neutral though. Also in the defense of physics: I believe there would have been a few quite devastating world wars if it weren't for the nuclear bomb. MAD was completely insane but it worked. Nah, population follows food supply. The best you can do vs famine is to make the food supply as steady as possible, and that's basically the opposite of what agriculture does. I am going to assume that there is a fade-out between panels 1 and 2; I am sure Randall knows that the "All science is either physics or stamp collecting" quote is not by Feynman, but by Ernest Rutherford... who then went and got a Nobel prize in stamp collecting Chemistry. Sofie wrote: Nah, population follows food supply. The reasons for this are varied, but boil down to 1. Poor people have more reasons to have kids (infant mortality, child labour, care for the elderly), while rich people have more reasons not to (basically, there's a lot of things, more fun than raising kids, which cost money). That's a win for wealth in general. And 2. Modern birth control has made having children a choice, which differs from the normal population growth models. That's yet another win for biologists, figuring out pregnancy well enough to prevent it consistently. *edit* although again, I must admit that while the biologists figured out what needed to be done, it was mostly chemists who knew how to do it. So few words, so many differences from actual fact - at least for the last century. Famine is disappearing in most of the world. The food supply is increasing in steadily, worldwide, much faster than population, except for nonsense like foodohol fuel. The population is leveling off, mostly because of the education of women. Illiteracy is plunging towards zero, even older adults in poor countries are learning to read. The world isn't perfect, but we have made progress, and we know how to make more. Read Charles Kenny's "Getting Better" and Steven Pinker's "The Better Angels of Our Nature: Why Violence Has Declined". Look at what Mercy Corps is doing in the world, and contribute what you can. Rather than spreading discredited fables (Malthus never bothered with facts), some of us are busting our asses to push towards improvement as fast as we can. Fewer children die every day of famine and war, but thousands still do, and even one is too many. leafar wrote: I am going to assume that there is a fade-out between panels 1 and 2; I am sure Randall knows that the "All science is either physics or stamp collecting" quote is not by Feynman, but by Ernest Rutherford... who then went and got a Nobel prize in stamp collecting Chemistry. I guess that by that quote Chemistry would be considered sub-fields of Physics. But really, the only thing that draws a line between sciences is how they are being thought of in education; Chemistry and Physics have strong overlaps, as do Chemistry and Biology, to a maybe lesser Degree also Chemistry and Biology. Every field has made use and also contributed to Mathematics one way or another, and Computer Science is everywhere these days anyway, while drawing inspiration from those other fields. And in the end, all these were once considered forms of Philosophy and regardless how we think of it have a Philosophy of Science as a foundation. I also know of a novel series, where Physics is called "Applied Theology" which, while fictional, nicely stresses the importance of historical context for such distinctions. Perhaps it is that the comic is like stamps pasted on a page; like in the real universe, time is neither contiguous nor logical. Since the discovery of fire, the greatest scientists have been ... cooks and bakers. Their applied chemistry has fed--and continues to feed--billions of people. Neil_Boekend wrote: As an engineer I can state that my field is also Neutral. I'm doubting between True Neutral and Lawful Neutral though. Engineers are definitely chaotic neutral. Source: I am an engineer. Has anyone actually plotted deaths by war (per capita) versus time? I'm fairly sure that those physicists did not create a new horseman, but 'slew' war by realising Nobel's dream of a weapon so terrible that we refuse to use it. Meanwhile in a bunker somewhere in places that are classified in a number of countries, Ms. Biology, resides biological agents, weapons that during World War II even Hitler considered too horrifying to use. Indeed biological warfare has been a part of humanity's arsenal for thousands of years. You presume to lecture me about nuclear weapons? If anything, Physics was late to the party when it comes to extinction level stuff. You claim to be eliminating a horse of the Apocalypse? Your community built them a stable. hdhale wrote: Meanwhile in a bunker somewhere in places that are classified in a number of countries, Ms. Biology, resides biological agents, weapons that during World War II even Hitler considered too horrifying to use. Indeed biological warfare has been a part of humanity's arsenal for thousands of years. You presume to lecture me about nuclear weapons? If anything, Physics was late to the party when it comes to extinction level stuff. You claim to be eliminating a horse of the Apocalypse? Your community built them a stable. Thumbs up to this. I take it that the stable is the CDC? And how come math isn't up there on the stage? The truths of mathematics are eternal, and will long outlive humanity, and in a sense, perhaps even the universe itself. Biology and physics may have created apocalyptic horrors, but mathematics is immortal. Beat that, chemistry! philip1201 wrote: Has anyone actually plotted deaths by war (per capita) versus time? I'm fairly sure that those physicists did not create a new horseman, but 'slew' war by realising Nobel's dream of a weapon so terrible that we refuse to use it. Yes, absolutely. Pinker's book mentioned above focuses on it, but the situation is a bit worse than when it was published. Definitions vary, and there is some variation. Our long-term trend is downward, with large societies able to enforce much greater peace in everyday life than in the past. Dramatic, but the tally of deaths from deliberate biological attacks is rather small compared even to chemistry's toxic gas events. Still, the whole debate is a great exercise in taking credit and shifting blame, because anything involving humans can be connected to any of the fields. drazen wrote: And how come math isn't up there on the stage? The truths of mathematics are eternal, and will long outlive humanity, and in a sense, perhaps even the universe itself. Biology and physics may have created apocalyptic horrors, but mathematics is immortal. Beat that, chemistry! Math is up on the stage. All science is impossible without math. Look how Ms. Biology showed her field was better... with statistics, a type of math. Most deaths from "biological warfare" occured before biology developed as a science. Columbus initiated the greatest mass extinction of human beings the planet has ever seen, bringing diseases that wiped out hundreds of millions of people across the western hemisphere before 1650 CE. Scientists are still learning about this horror, how it reshaped global history and even global climate, and how to stop it in the future. keithl wrote: Most deaths from "biological warfare" occured before biology developed as a science. Columbus initiated the greatest mass extinction of human beings the planet has ever seen, bringing diseases that wiped out hundreds of millions of people across the western hemisphere before 1650 CE. Scientists are still learning about this horror, how it reshaped global history and even global climate, and how to stop it in the future. Mirkwood wrote: Political Science: We helped create institutions that have preservedredefined war such that we can say that we've had "world peace" despite there being war-like "armed conflicts" almost continually for the longest time in modern history! And we're pretty sure it'll all collapse some day, but we're not sure when, so until then we call it a victory. Huh? I thought we gave them syphilis. I learned this from watching Buffy, by the way. Also, Henry VIII had congenital syphilis and passed it to his daughter Mary I. Science is thoughtful counting. Galileo transformed physics with counting, Lavoisier transformed chemistry. Biology is still completing the transformation from description to counting, but the biocounters are making spectacular progress against entrenched biodescriber opposition. Math is also split between description and accounting; the mathematical descriptivists infesting string theory are creating theologies out of abstract and measurement-free speculation. There is not one "math". Getting the descriptions right is important - are observed type 1a supernovae only one standard type (as assumed by expansion cosmologists), or many ,? We'll figure that out with measurement and counting. Sadly, almost all science popularization (see  above) is numberless description, too often with numbers added only to mislead and alarm. And...without pestilence, world population has doubled almost three times in 100 years after remaining fairly stable for thousands - mainly because biology (and chemistry, and physics) is pretty ineffective against human selfishness and stupidity. The story is more interesting than that. The prehistoric immigrants to the Americas were genetically very uniform, with only two alleles for HLA, the human leukocyte antigen system that presents foreign proteins to cell walls for identification (and often cellular destruction) by white blood cell macrophages. Europeans have dozens of HLA types, and Africans have many more. Individual Europeans are typically not "more immune" than American aboriginals, even to diseases common in Europe. Europeans are immunologically more diverse, so a pathogen adapted to one HLA type will be far less infectious in individuals with different HLA types. The rapid adaptation and spread of disease is thwarted in HLA-heterogeneous populations. First Americans had very few domesticated animals, the usual source of pathogens. That, and better hygiene, and tribal isolation are probably why American Indians survived. Still, I wonder how many precolumbian civilizations were wiped out by epidemics, crowded urbanizations next to disturbed jungles with exotic disease-laden mammals escaping the fires of slash-and-burn agriculture. So is this comic the antithesis to Purity? Emphasizing the practical over the theoretical? Civil engineers create the targets. Electrical engineers locate the targets. Chemical engineers make bombs to destroy the targets. Mechanical engineers deliver the bombs to the targets. Also, civil engineers dig material from holes in the ground and stack material into the air, making the Earth fluffy. Civil engineers or their opponents are good or bad, depending on your vertical density gradient preferences. Chemistry is to thank for ending Famine. Thank you Dr. Haber. But yeah, one of us! One of us! Defining the disease part of the Columbian Exchange as "biological warfare" is idiotic on the face of it. Let's break this down, shall we? 1. It assumes it was intentional. 2. It assumes that it wasn't inevitable. Unless you wanted to isolate the Americas from all outside contact, it was going to happen at some point. 3. It ignores the near-constant warfare between tribes by blaming all (or almost all) population reduction during that time on disease. Guns and horses contributed to this, but shouldn't we be laying blame on those that actually did the mass murdering? Contrary to popular claims, the evidence shows that this was more often the tribes that survived to modern day than it was settlers. In other words, stop with the white guilt-inspired idiocy and look at the actual evidence. These are TF2 videos, if you're into that. Weirdo. chenille wrote: Chem: well, we helped a lot! Both causes, actually, we're pretty lawful neutral over here. I don't think so: napalm, Agent Orange, mustard gas, nerve gas,... . Even balanced against, say, craft beers, you chemists are almost as bad as us physicists. From a purely personal point of view, craft beer makes up for a ton of sins. And...creates a different kind of gas. Computer Science, on the other hand, has a great Good to Bad ratio. You know, until the singularity anyway. So who are the horsemen now? What do you call the nuclear horseman? Mutation? Annihilation? I guess Decay sounds right. I'm not sure who replaced Famine. Uh. Global warming maybe? That's mostly predictions of future bad stuff, at this point. We should probably wait until it actually causes more bad stuff than tornados before calling it apocalyptic. Whatever. I guess we're still accepting resumes for the black rider's replacement. So we have War riding a red horse, <Redacted> riding an invisible horse, Decay riding a lumpy horse, and Death riding a pale horse? Actually, didn't Eowyn defeat War at the battle of Gondor?